Earning Serendipity offers a fascinating set of ideas and tools you can use to create meaningful, sustainable change in your work and in the rest of your life. 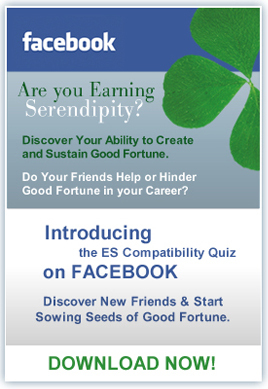 Its no coincidence you picked up Earning Serendipity by Glenn Llopis. Its philosophical approach to business is fresh and interesting, with a touch of elder wisdom. Take my advice and read this book. "The most courageous journey that I know is the journey within. Start there and realize how Earning Serendipity will be your road map for extraordinary outcomes in your life and the lives of others." "In our challenging and uncertain times, Glenn Llopis presents clear and positive lessons for a new form of enlightened businessone that addresses both the professional and civic responsibilities of his audience." "Earning Serendipity took me on a ride through a world I had never fully considered before. Llopis is absolutely right; there is more happening around us than we realize, and good fortune is there for the taking." For some people, success seems fated or shrouded in mystery. 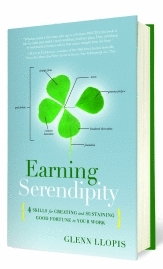 But in Earning Serendipity, Glenn Llopis will show you that most positive changes in fortune—in careers or in corporate ventures—are no mystery at all. Broaden your observation beyond what you seek and beyond the obvious details before you, and enlarge your field of opportunities; search within conversations and adverse circumstances for possibilities. When good vision is met with consistent, hand-dirtying execution every day, the result is a stable, growing fortune; focus on proper timing and proper depth. Learn how to recognize the most promising opportunities and give them the right amount of attention; don’t let the best opportunities wilt and don’t waste energy on opportunities with limited potential. Focus on meeting others’ needs to improve personal good fortune; make generosity part of your purpose, an integral part of the DNA of your career or company. Those who master this quartet - tap into a power most never reach: the power to create and sustain a momentum of good fortune. This ability to earn serendipity can elevate your career or company quicker than any single force. And with the skills outlined in this book, you will be catapulted onto the path of prosperity. 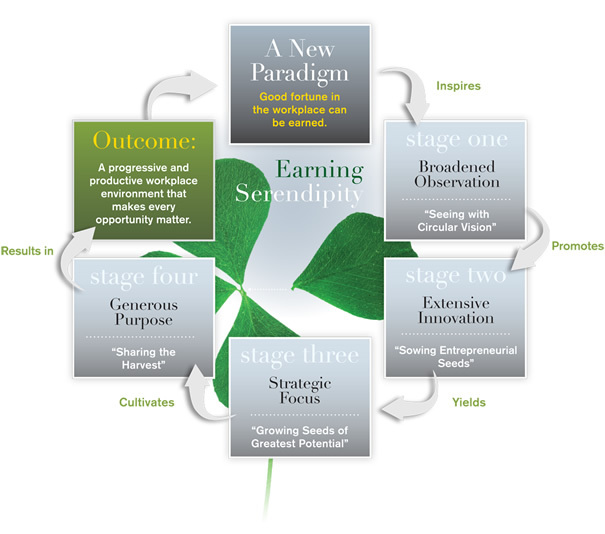 The Methodology: The Earning Serendipity Methodology ™ teaches a unique combination of entrepreneurial skills that yield a progressive workplace brimming with innovation and and initiative. Summary: Your life is not a matter of chance. Good fortune can be earned if you adopt the principals in The 4 Leaves. Summary: Great opportunities are available to those with keen observation.Learn how to spot them in the obvious and obscure places all around you. Summary:Great ideas are so rare because so few are ever planted. Learn not only how to be an innovator but also how to sow entrepreneurial seeds wherever you are and thus multiply your propensity for success. Summary: Many seeds of good fortune die in the soil of haphazard care. To sustain the momentum of good fortune, you must learn to tend only the seeds of significant growth. Summary: The seeds of good fortune produce a harvest too great for one person. Learn how expanding your purpose beyond your dreams multiplies your momentum of good fortune. Summary: A garden of good fortune can spread rapidly and produce more than you thought possible. Learn from Serendipiters past that when you create and sustain good fortune, your potential is much bigger than you thought.